The reclamation and utilization of debris flow waste-shoal land plays an important role in the mitigation and control of debris flow hazards, which thus contributes a lot to the exploitation of insufficient land resources in mountainous areas and the reduction of losses caused by debris flow. The aim of this paper is to discuss the features and mechanism of soil evolution of debris flow waste-shoal land so as to search for the available modes of its reclamation and utilization. The Jiangjiagou Ravine, a typical debris flow ravine, was selected to study soil evolution features of debris flow waste-shoal land based on the analysis of soil physicochemical properties and soil microstructure. 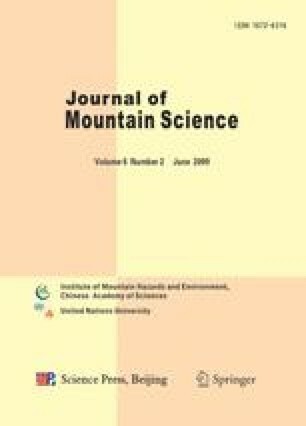 It was found that the soil evolution rates of debris flow waste-shoal land varied with different modes of reclamation. For the land which had been reclaimed for less than 10 years, soil evolved most rapidly in paddy fields, and more rapidly in dry farmland than in naturally restored waste-shoal land. For the land which had been used for more than 10 years, the soil evolution rates of dry farmland, naturally restored waste-shoal land and paddy farmland decreased in the file. For the same utilization period of time, significant differences were recognized in soil evolution features under different modes of reclamation. Analysis data showed that soil clay content, soil thickness, the psephicity of skeleton particles and contents of microaggregates (<0.02 mm) in paddy farmland were all highest. Soil nutrients and porosity of dry farmland were better than those of paddy farmland and naturally restored waste-shoal land, and those of paddy farmland were superior to those of naturally restored waste-shoal land. Paddy farmland characterized by rapid pedogenesis, stable evolution and high utilizability was the priority candidate for the reclamation and utilization of debris flow waste -shoal land.